Figure 1. Treatment of A-431 cells with EGF stimulates phosphorylation of Stat1 at Tyr701 but does not effect the level of total Stat1. 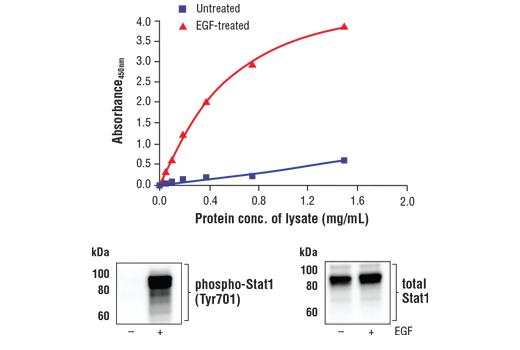 The relationship between lysate protein concentration from untreated and EGF-treated A-431 cells and the absorbance at 450 nm using the FastScan™ Phospho-Stat1 (Tyr701) ELISA Kit #40716 is shown in the upper figure. The corresponding western blots using phospho-Stat1 (Tyr701) antibody (left panel) and Stat1 antibody (right panel) are shown in the lower figure. After serum starvation, A-431 cells were either left untreated or treated with 100 ng/mL EGF for 5 minutes at 37°C, then lysed. The FastScan™ Phospho-Stat1 (Tyr701) ELISA Kit is a sandwich enzyme-linked immunosorbent assay (ELISA) that detects endogenous levels of Stat1 when phosphorylated at Tyr701. To perform the assay, sample is incubated with a capture antibody conjugated with a proprietary tag and a second detection antibody linked to HRP, forming a sandwich with phospho-Stat1 (Tyr701) in solution. This entire complex is immobilized to the plate via an anti-tag antibody. The wells are then washed to remove unbound material. TMB is then added. The magnitude of observed signal is proportional to the quantity of phospho-Stat1 (Tyr701). Antibodies in kit are custom formulations specific to kit. The FastScan™ Phospho-Stat1 (Tyr701) ELISA Kit detects endogenous levels of Stat1 when phosphorylated at Tyr701 as shown in Figure 1. This kit detects proteins from the indicated species, as determined through in-house testing, but may also detect homologous proteins from other species. The Stat1 transcription factor is activated in response to a large number of ligands (1) and is essential for responsiveness to IFN-α and IFN-γ (2,3). Phosphorylation of Stat1 at Tyr701 induces Stat1 dimerization, nuclear translocation, and DNA binding (4). Stat1 protein exists as a pair of isoforms, Stat1α (91 kDa) and the splice variant Stat1β (84 kDa). In most cells, both isoforms are activated by IFN-α, but only Stat1α is activated by IFN-γ. The inappropriate activation of Stat1 occurs in many tumors (5). In addition to tyrosine phosphorylation, Stat1 is also phosphorylated at Ser727 through a p38 mitogen-activated protein kinase (MAPK)-dependent pathway in response to IFN-α and other cellular stresses (6). Serine phosphorylation may be required for the maximal induction of Stat1-mediated gene activation. Durbin, J.E. et al. (1996) Cell 84, 443-50. Meraz, M.A. et al. (1996) Cell 84, 431-42. Ihle, J.N. et al. (1994) Trends Biochem Sci 19, 222-7. Frank, D.A. (1999) Mol Med 5, 432-56.